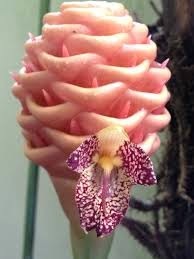 Beehive ginger (Zingiber spectablis) are a species of ornamental ginger cultivated primarily for their distinctive appearance. Most people are familiar with edible ginger (Zingiber officinale) but it is only one of hundreds of the Zingiberaceae family. These colourful and exotically stunning flowers instantly add a dash of the tropics to any room or garden. Beehive gingers grow well in pots and are brilliant in any Coffs Harbour garden. These plants can grow almost to 2 metres high with leaves up to 30cm long. These gingers get their common name from the fact that the bracts, which are modified leaves, grow in the shape of a beehive. Native to Southeast Asia, beehive gingers, like all ginger plants, thrive in warm, humid climates. They do need space though and indirect sunlight as too much strong sun can scorch the leaves. Although having said that, the red are more vibrant with more sun. Gingers really enjoy a consistently moist soil.